What a combination of flavors we got going in this sandwich! So quick and easy to put together in the morning and yet so absolutely delightful to the taste! Its bursting with pesto, spinach, and feta! 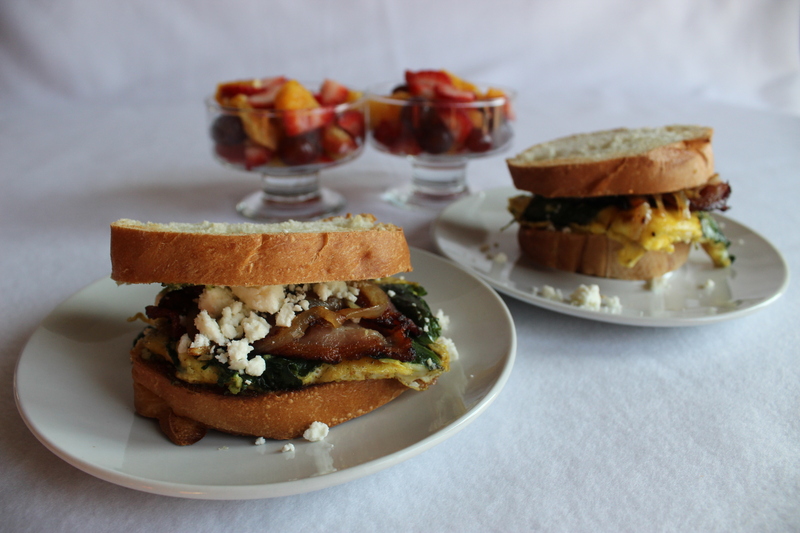 I was first introduced to this amazing breakfast sandwich at my beautiful, sweet, gracious, talented, sister-in-law Abby’s place. The saying is “never trust a skinny cook” but this brothers wife of mine has proven to be trusted even though she’s as slender and beautiful as ever. =) And she made a feast for my sister and I! On top of these delicious sandwiches she also served strawberry yogurt parfaits, fresh fruit cups, and amazing pastries with coffee! Her hospitality is outstanding and I plan to visit her home many times in the future! And I’ll definitely make sure its brunch time! =) haha. Here’s the recipe. Adjust amounts according to how hungry you are! I made these this morning for Saturday brunch and my darlings thought they were a hit! Cook bacon and sliced onions in skillet. Take out. Add a handful of spinach to bacon grease. Cook for 1 minute. Crack about 5 eggs into bowl. Add a splash of milk and whisk until smooth! Pour the eggs over spinach and season to taste. Flip eggs and fry the other side. Toast sliced french bread until golden. Butter. Add a thin layer of pesto sauce to each slice. (I bought my pesto but you can also make your own!) 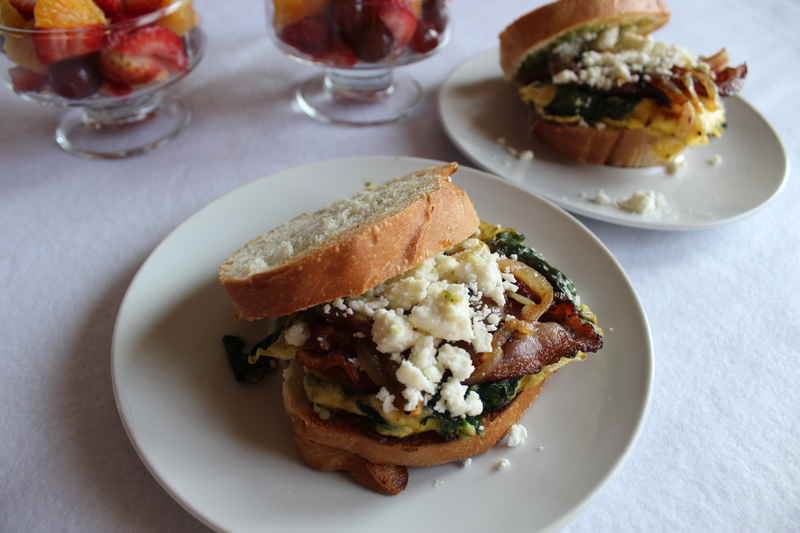 Assemble sandwiches with eggs/spinach, bacon, onions, feta cheese and enjoy!